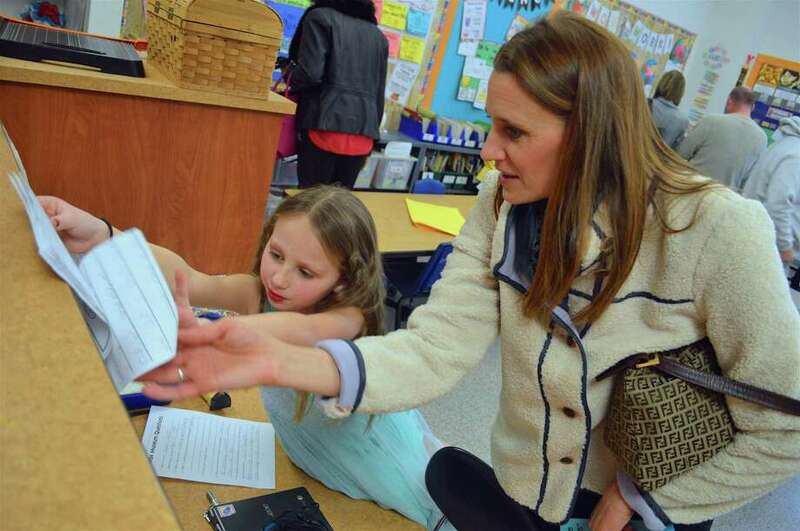 Clair Zuanelli, 7, of Easton, shares some details about being Taylor Swift with her mom, Karen, at the 2nd grade's living wax museum at Samuel Staples Elementary School, Friday, Feb. 1, 2019, in Easton, Conn.
EASTON — History literally came to life at Samuel Staples Elementary School Friday morning when students in the second grade classes took part in a living wax museum. Kids took on the role of famous individuals they found of interest, then shared about their unique histories to a group of visiting parents. “We do this project because it encompasses both our nonfiction reading and writing unit (and) several of our second grade social studies standards,” explained teacher Sarah Lewis. “I think there are several reasons why the kids love this project so much,” she said, including the creativity, freedom to choose, and it’s an exciting introduction into a first independently researched project. “Our recurring question to the students is, ‘What did the person do to help change the world and why should we remember them today?’,” Lewis said.